Florence Continental Hotel is strategically collocated on the bank of the bus stand near Gulab Bagh. It is also very close to the city center, the hotel provides a base for shopping, dining out and visit to places of interest. 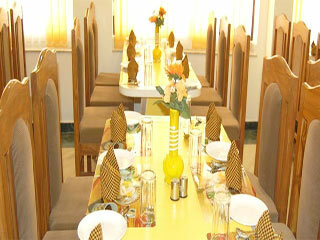 The Florence Continental Hotel offers a panoramic view of bus stand Near Gulab Bagh. Hotel offers comfortable and budget staying service to its guest so that everybody can make their tour enjoyable and unforgettable within budget. Every room offered to the guest is equipped with AC, Cable TV, and Intercom Facility. Airport is about 20 kms., whereas railway station is approximately 1km away from hotel. Bus stand is on walking distance (.05km). Breakfast Services, Coffee Shop/Cafe, ATM/Banking, Doctor on Call, Complimentary Newspapers in Lobby, Security Guard, Room Service, Airport Transportation, Wedding Services, Laundry Facilities. Reading Lamps, Wakeup Calls, Attached Bathroom, Air Conditioning Room, Cable/Satellite TV, Complimentary Newspaper, Smoking Rooms, Climate Control, Desk, Room Heater. User reviews for "Florence Continental Hotel Udaipur"